Wyoming Breezes: Let's Do Lunch . . .
You are rich for friends are a treasure! Wonderful painting-thanks for sharing! I still meet with my retired teacher friends every few months to catch up. That painting reminds me of the deer that ate all my tulips this year. They never even had a chance to bloom. That's never happened before. I have a couple of friends that I meet for lunch or breakfast but not as often as I should. Oh yes! I had a Monday lunch group in Orlando. We got together every Monday for almost 25 years. The "cast of characters" changed over the years, but two of us were originals. In all that time I only missed 4 Mondays. Now, I live in PA and I meet an old friend for coffee every week or two and I meet another friend and her foster daughter every Tuesday to knit and chat. My lunch/coffee group of friends is gradually shrinking as 3 of the 6 of us has moved away recently. 1 of the remaining spends the winter in Florida, and the other travels out of state to visit family frequently. But we have fun when we are able to get together. 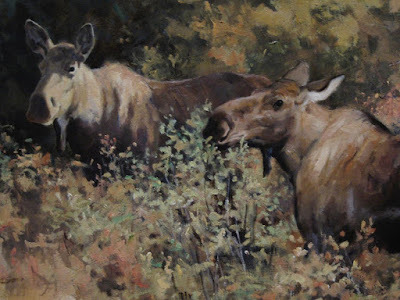 Your picture reminds me of a group of elk we saw grazing last night at sunset. There must have been 50 of them in the field. We stopped the truck and just sat there and watched them for about five minutes. I don’t get to do lunch very often with friends. Most of my friends are still working. However our knit group on Tuesday mornings usually has breakfast/lunch together while we knit. Casino!!! Nancy, how fun! Yes, Fireman and I do meet friends for lunch. It is usually less costly than dinner . Im not one to get up early and go to breakfast! I love the moose! I would love to see some Moose someday. Your photo reminded me of the time a couple of years ago when we saw a mama moose with her baby just off the road in Colorado. I do get together with friends for lunch; lately though our schedules don't seem to coincide as well as they did before our DHs retired. We go for lunch once a week, it is actually a late lunch early supper at a place in the boonies they have great burgers and are so big we share one. It is just about the only place we go to eat because Thursdays is a slow day there and not many people are around...so it is "safe" for us to go. I sometimes go to lunch with my Mom and I have a friend who I meet sometimes. Oh yes. As a teacher I couldn't really go out to lunch that often. (No doubt you understand that!) So, now when I can I try to make lunch dates.... although, thinking about it, I generally go out to lunch with hubby. Lunch is our preferred meal out -- less expensive, leftovers for dinner, and less traffic to fight. The painting and title are great. I haven't seen a lot of wildlife recently except a beautiful fox casually walking between my friend's house in Columbia, MD at about 8:30 in the morning. Healthy looking fox too. Our "Lunch Bunch" from Class of '66 meets monthly for a nice meal and chat. We reminisce, discuss current events and a wide variety of topics, among this group of mostly retired career women. The subject of this post "Let's Do Lunch" has inspired my sharing of your blog (which I visit daily) with these friends.